Welcome back to the Paper Craft Crew Challenge! This week we have an inspiration challenge. I was excited because, well, COFFEE! I have had some Doodlebug Design coffee goodies that I have been meaning to use up plus the set Simon Says Stamp Coffee & Tea, and it was also great because I could put the whole card together with very little stamping while I was updating stuff on my computer for work. Stinkin’ cute! The coffee cup and beans are cardstock stickers called Doodle-Pops from Doodlebug Design. I got the papers from their Cream & Sugar pad that is also part of this product line, except the gingham paper, which is from their Gingham-Linen Rainbow Petite Prints 6 x 6 pad. I love how you can mix and match papers from different pads without any problems. The greeting is from the Simon Says Stamp Coffee & Tea set, stamped in Versamark, and embossed with Brutus Monroe Coffee Grounds embossing powder. This was my first time using their EP, and I have to say, it is beautiful stuff! I subscribed to their monthly embossing powder subscription, and it came in the mail just in time to make this card. A couple of little heart sprinkles from Doodlebug Design make a cute tiny accent that matches the heart the coffee cup is holding! I’m glad I finally got to use the Simon Says Stamp Coffee and Tea set…so many cute coffee and tea images and sentiments. What took me so long?!?!? I love this range and you have used it perfectly. love the whole design. 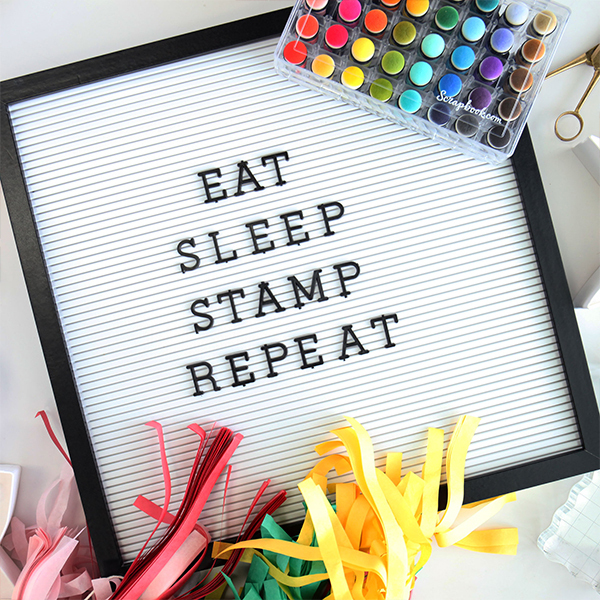 Thanks for joining us at Simon Says Stamp Wednesday Challenge blog.